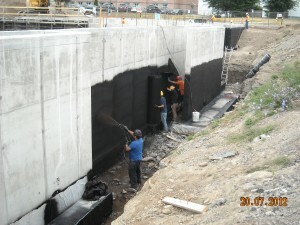 Adseal is a major commercial water-proofing contractor in Eastern Ontario. We offer a worry-free turnkey service with supply and installation of all water proofing and top coating materials. We are often called upon to provide technical advice and recommendations. With a vast experience and resources at our finger tips, we can assist in solving many kinds of protective coatings, water-proofing membranes and insulation problems. 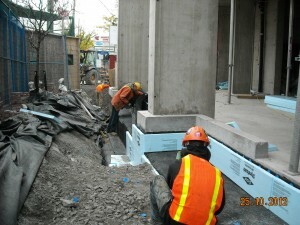 Adseal is equipped to install all types of water-proofing membrane systems. We handle projects of all complexities from plaza decks, cementitious coatings within water tanks plant facilities to watertight gas and vapor barrier on under-slabs. Our full time professional installers are prepared to complete your projects on budget and on time. Contact us to discuss any design problems you encounter. We will always step forward to assist in finding a solution. The foundation is one of the main structures of a home. It is very important to keep water away from the foundation, and make sure it does not leak. For typical residential applications we apply either liquid bitumen or a highly polymerized water based emulsion membrane on these foundation exterior walls. We then follow up by installing a protective drain board system over the membrane. The membrane forms a protective coating on the foundation walls whereas the drainage board system keeps water away from the structure and relieves any hydrostatic pressure exerted on the foundation. The drain board also acts as protection for the foundation from the back-fill. The systems we install are proven to be cost effective and efficient. They also meet the CCMC requirements. Please give us a call to discuss your specific engineering requirements. © 2019 Adseal Services. All rights reserved.